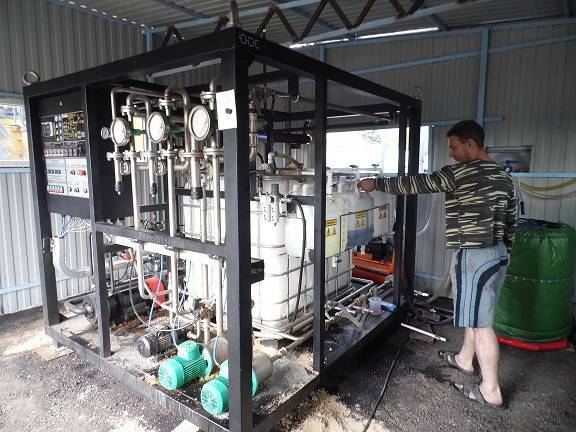 On 30 June 2014, GlobeCore employees traveled to European country and conducted a successful launch and commissioning of GlobeCore model UVB-1 intended for the production of bitumen emulsion. Bitumen emulsion equipment manufactured and supplied by GlobeCore, is increasingly in demand. This is the result of a wide spread acceptance of and demand for the cold process mix in preparation for the pavement, repair, and construction of roadways. If you are a company engaged in road repair, road construction, building and structure construction, or production of asphalt mixes, the bitumen emulsion equipment from the Globecore is just what you need! The GlobeCore UVB- 1 does not emit harmful gases into the atmosphere. Modification of the model with different capacities allow you to select the most suitable model for your specific conditions. A climate version of the UVB-1 produces bitumen emulsion almost all year round from early spring to late autumn, without stopping earlier programmed processes.